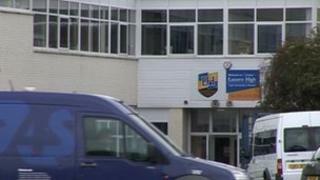 Officials in Cardiff have confirmed that the bug responsible for Legionnaires' disease has been found at a new super-school. Eastern High School in Cardiff opened on Monday, bringing together about 1,500 pupils from the former Rumney and Llanrumney high schools. However, staff told parents on Wednesday evening that it had to close. Cardiff council said the school would remain shut on Friday while the issue was dealt with. "We are sorry that Eastern High will need to remain closed tomorrow in order for essential maintenance work to continue following the discovery of legionella bacteria during a routine test at the school," said a spokesperson for the school. "As a precaution, due to the work which needs to be undertaken and the disruption this will cause to the school, it will remain closed until further notice." Legionella bacteria are often found in water systems and must be chemically treated to kill of the bug otherwise they can multiply and become airborne in water droplets, leading to Legionnaires' disease. The infection can prompt a potentially life-threatening form of pneumonia. "The legionella bacteria is of low risk to health and is commonly present in the environment but the school's water system does need to be chlorinated thoroughly as a result," added the school's spokesperson. "We have been speaking with healthcare professionals, who have assured us that Legionnaires' disease, which can arise as a result of this bacteria, cannot be transmitted from person to person or as a result of drinking water or hand washing." Public Health Wales said no cases of the disease were under investigation. "We have been informed that legionella has been found as part of routine water testing and understand that the problem is being rectified," said a spokesperson. "Usually in these cases there is unlikely to be a risk to public health and once the work is successfully completed staff and pupils should be able to attend school as normal." Staff contacted parents by text message on Wednesday night to say the school would have to close. A statement was also posted on the school website apologising that the new super-school was closed due to "unforeseen emergency maintenance work". "We apologise for the short notice and inconvenience," it said. "We will keep you updated and are working to open the school as soon as possible." The merged school opened after a reorganisation of secondary education in the east of the city. The closure of Llanrumney High School was brought forward by a year, with ministers concerned at the drawn-out process after it was put in special measures last October.